It’s not about the data, it’s about the insight. While the accumulation of data shows no signs of slowing, some argue the term “big data” has passed peak marketing hype. This is a good thing, because it allows people to focus more on the real reason we’re generating, cleaning, storing, and analyzing every bit of data we can get our hands on: to find patterns that answer questions we’ve never thought to ask, or never been able to answer; to help us understand the world and make better decisions; in short, to get to the next big insight. Building on established Northwest strengths such as cloud computing and enterprise software, Seattle-area startups and technology giants alike are defining a new regional specialization here in big data platforms, tools, and applications—technologies with the potential to transform virtually every field of human endeavor. And investors are taking note: some 15 local companies working on some facet of big data have raised more than $80 million in venture capital in the last year alone. Tableau Software, a leader in data visualization, raised $177 million in one of the year’s best technology IPOs—and also claimed the appropriate ticker symbol, DATA. The company has since watched its market value rocket to more than $4 billion. 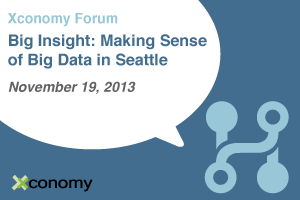 Xconomy has been covering the big data field in Seattle and across the country. Now we’re bringing together a distinguished group of business and technology leaders on Nov. 19 to share their perspectives on Seattle’s opportunities in big data technologies, and more importantly, on getting from data to insights. —Oren Etzioni, executive director of the new Allen Institute for Artificial Intelligence, and former UW computer science professor who helped create some of the most successful big data startups to come out of Seattle, including Decide, acquired recently by eBay, and Farecast, acquired in 2008 by Microsoft. Other highlights include an investor-entrepreneur chat with Matt McIlwain, managing director at Madrona Venture Group, and Carlos Guestrin, founder and CEO of GraphLab and the Amazon Professor of Machine Learning at the University of Washington. They’ll talk about how the Seattle tech community has pulled together in the last two years to add Guestrin and other top computer science talent to the UW’s already stacked big data lineup. We’ll also hear from leaders in big data platforms and tools including Tableau Software engineering VP Andrew Beers, SpaceCurve CEO John Siltz, and Pivotal SVP of strategy and corporate development Leo Spiegel; and from researchers pushing the limits of data-driven science including Roger Barga, principal group program manager at Microsoft Research, Joseph Hellerstein, manager of computational discovery at Google, and Ed Lazowska, Bill & Melinda Gates Chair in Computer Science & Engineering and founding director of the eScience Institute at UW. There will be plenty of time to network before, during, and after our program. We’ve just opened registration and the best deals on tickets are available now. Please join us. Great insight, I agree with that.